An agreement was reached between club members and Gold Hill Station, a hobby shop specializing in model trains. Gold Hill Station had recently relocated from Cornwall Street to 111 Grand Avenue in downtown Bellingham, and agreed to have the club build its layout below the store in a space the club would use rent-free. Unfortunately, Gold Hill Station closed shortly after the initial stages of the layout were completed. With the store's demise, the club went through a period in which it was unclear whether it would be able to remain at the Grand Avenue location. Happily, arrangements were made with the landlord after the new tenant, MindPort, a hands-on science gallery, moved into the former Gold Hill Station space. 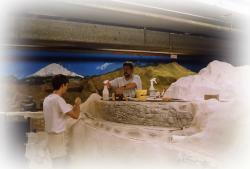 Work began anew on the HO-scale layout (1/87th the size of real trains) in 1995. Much of the original layout was demolished and rebuilt. The track plan was redesigned by club members and drawn using AutoCAD, a popular computer-aided design program. Although the trains are only scale models, the grades on the layout can't be much steeper than those in the real world. The CAD program enabled the BSME to design new sections of the layout within the accurate three-dimensional computer model, so members would know that everything would fit and work properly before building commenced. The CAD system also helped members plan the sometimes complex wood and steel construction that supports the visible portions of the layout, and enabled members to experiment with new ideas before laying track. When the layout was begun, trains were controlled by breaking the track up into short electrically isolated sections called blocks. To control a particular train, members controlled the voltage on that block of track. As the train moved into the next block, operators would throw toggle switches so that they could control the voltage of the next block. Although this is how most layouts were operated at the time, it was cumbersome and didn't allow that many individual trains to be operated at once. In addition, it was easy for a member to lose control of his or her train if it inadvertently ran forward into a block that was occupied by another train and therefore under the control of someone else. This block control system also resulted in literally miles of extensive, complicated wiring. In the fall of 1997, the club abandoned its conventional block control system and installed a new type of system called Digital Command Control (DCC), which was purchased from Digitrax, one of several companies that had begun to offer such systems. In a DCC system, each locomotive is fitted with a small computer chip called a decoder, and is assigned a unique address. The complex wiring was removed and replaced with a single pair of wires that delivers a constant voltage to all of the track. The model engineers use a small handheld throttle set to the address of their specific locomotive. The throttles send a digital signal across the track that tells the specific locomotive what to do: speed up, slow down, go forward, reverse, and so on. Each locomotive responds only to signals sent to its specific address and ignores the signals sent to any other address. In that way, members can control a virtually unlimited number of trains all running simultaneously, without any of the restrictions imposed by the old-style block control. In effect, they control the trains, not the track. Of course, the new system does have one potential drawback. It is now possible for trains to collide head-on. But that sometimes happens in the real world as well. The end result of DCC is that the model engineers now operate the trains in a fashion much more like real engineers. The BSME was one of the first large club layouts in the country to switch over to DCC. Many other clubs and individuals consulted with BSME club members as DCC became an accepted standard among model railroaders. 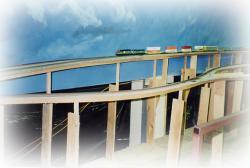 In 1999, club members added another new dimension to the layout. The DCC standard also presents the ability to control sound and lighting effects. Several members began experimenting with installing sound-equipped decoders and speakers inside their locomotives. Model engineers could now not only control the speed and direction of the trains, but also blow the whistle. Suddenly, the miniature locomotives sounded like the real thing. Diesel locomotives feature the deep thrum of massive generators and steam engines mimic the distinctive chuff and clatter of actual engines, all digitally recorded and stored on the miniature chips inside the scale models. The addition of sound was an immediate hit and many of the trains running on the club layout now have realistic sound. 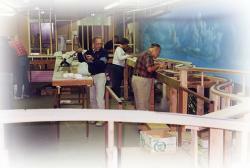 The BSME layout grew into one of the largest model train layouts on the west coast. It was housed in a space measuring over 100-feet by 30-feet. 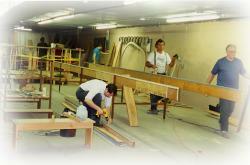 In addition to the layout itself, there was also a club meeting room, workspace, library, and storage areas. There was also additional space into which the layout could have grown in the future. An undertaking as large as the BSME layout could only be built in phases. 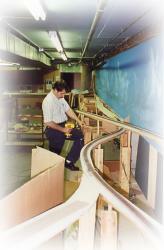 Initially, club members built a large section of the layout that operated as a big loop of track. During open houses, trains would simply be run continuously around this loop. While the layout was not based on any specific railroad, its many lakes, rivers, and mountains captured the flavor of railroading in the Pacific Northwest. As part of that flavor, the track climbed over a mountain pass, which culminated with a large curved wooden trestle that proved to be a focal point of the layout. Club members subsequently completed a second adjacent focus, a deep canyon with a lake at the bottom and a waterfall in the distance. The canyon was spanned by an impressive steel arch bridge. Both the wooden trestle and steel arch bridge were loosely based on actual structures and were built from scratch by club members. Each took over six months to complete. During the second phase of construction, which was completed in 2000, members added a major city representing Spokane as the eastern terminus of the railroad. With its completion, trains no longer ran in circles, but rather ended their journeys in Spokane, where they disappeared down a spiral helix, descending to a hidden staging area where members could "make up" a new train and send it out onto the layout. This type of mechanism is used on many large layouts, including the one at the Washington State Historical Museum in Tacoma. But the staging is usually hidden from view, so that visitors can imagine that the train has continued to additional destinations beyond the boundaries of the layout. It turned out, however, that many visitors were as equally intrigued by the helix as they were by the rest of the layout, and a decision was made to create windows into this hidden area so they could watch the train descend. Phase three commenced with work on the "other end" of the layout, the western terminus of Seattle, which also had a hidden staging area at the bottom of a helix. This area of the layout, while still not a duplication of the actual location, was to be closest in appearance to the actual city. Members planned to build a scale model of King Street Station and portions of the Seattle waterfront, and many of the other buildings would have resembled actual structures on the Seattle skyline. The painted backdrop would even include the Space Needle. The Seattle portion of the layout was housed in an area expanded into adjacent space, which increased the total area of the layout and provided room for an operating drawbridge and a three-ring circus under a "big top." Another aspect that members began to experiment with was the addition of live closed-circuit television broadcast from a moving scale model train. 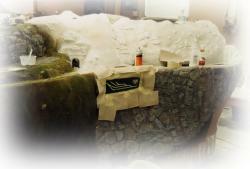 For the first time, visitors could experience the layout from a scale engineer's point of view. Using a miniature video camera, both the image and sound was broadcast from the moving train to several televisions located in the layout space, helping to further immerse visitors into the scale environment. 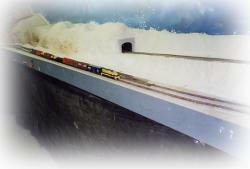 The original HO-scale BSME layout contained more than 10 scale miles of mainline track (over 600 linear feet of actual track). Since most of the layout consisted of a double-track mainline, however, and since that figure did not include the many industrial sidings, there was nearly 2000 feet of track on the layout. There were also more than 100 switches (or turnouts, as model railroaders refer to them so as to differentiate between electrical switches and the mechanisms used to divert or turn a train onto a different section of track). The layout was constructed from a wide range of materials. The track was all commercially made, purchased in three-foot sections and then carefully cut and bent to fit the necessary curves. Turnouts were also commercially made. Some turnouts were electrically controlled using hidden motors. Others were simply thrown by hand. 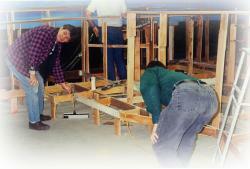 Buildings were made of plastic, wood, metal, or cardboard and built from kits or entirely "scratch-built" by members. Many of the buildings featured interiors and lighting. Several of the newer buildings included flashing neon signs. The terrain was created using plaster over a base of cardboard and wood. The underlying structure was wood and steel. The realistic rocks and concrete walls were actually cast plaster, painted to look like the real thing, although there were some real rocks as well. 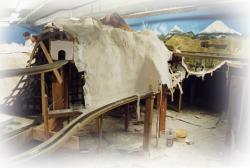 Nearly a ton of plaster was used on the layout. The "ballast" holding down the track was actual limestone from a local quarry, and was very similar to the rock used on the local Burlington Northern right-of-way, although at a much smaller scale. 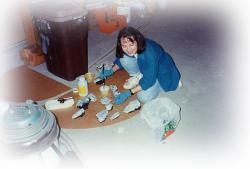 Ground cover was primarily finely ground foam rubber dyed to a variety of colors and held in place with glue. Trees were modeled from a variety of materials including foam rubber, furnace filters, cotton fiber, and other materials on armatures of wood, wire, or plastic, as well as real plant material such as weeds and roots. There were several thousand scale trees throughout the layout, and members planned to add thousands more. The "water" in the many lakes and rivers was actually plastic resin poured over realistically painted stream- and lake-beds. Several hundred scale "people" inhabited the layout, and hundreds more were to be added, along with cars, trucks, signs, mailboxes, street lamps, and even scale trash, to make the layout look as much as possible like the real world. 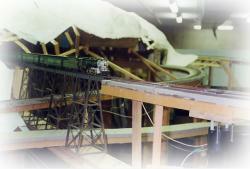 The entire layout was built by the volunteer members of the Bellingham Society of Model Engineers. 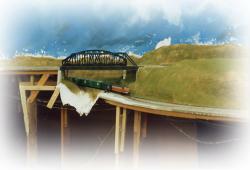 Membership in the club is open to anyone with an interest in trains and model railroading. 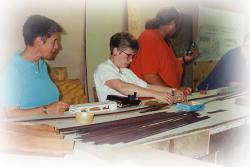 Members pay dues to support the club's operation. 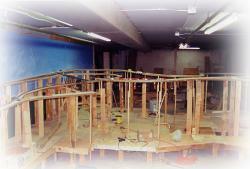 Other than dues, the club relies entirely on visitor donations in order to pay the rent and utilities, and to buy the materials used to build the layout. The original layout cost more than $20,000 to build. More than 30 members belonged to the BSME when it was located in downtown Bellingham. Members bridged a wide age span and represented a very diverse cross-section of backgrounds including people who work on real railroads and those who simply dreamed as children of someday being an engineer. Members included doctors, architects, engineers, computer programmers, teachers, electricians, machinists, truck drivers, and lots of others. Model railroading is actually one of the largest and actively growing hobbies in the world, yet some people are embarrassed to admit that they "play with toy trains." BSME members were very proud of the miniature world they built in downtown Bellingham. After nearly seven years of work, it rated as one of the most extensive and progressive model train layouts on the west coast, and was fast becoming one the best in the U.S. The club, which is actually a 501(c)3 non-profit corporation, owns the layout, including all the track, scenery, and electrical controls. Individual members own their own trains. An average member may spend as little as $40 or as much as $400 or more on a locomotive and DCC chip. Individual railroad cars average $12 each although prices vary and some members spend much more as they modify their rolling stock with more realistic couplers and other details. 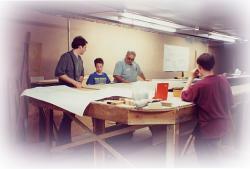 Members have access to the layout at any time and can run trains or work on the layout whenever they choose. Now called the WSMRC, the club opens its doors to the public at various times throughout the year and will do so more frequently as more of the layout is completed. In 2004, the National Model Railroad Association (NMRA), the largest organization for model railroad hobbyists, held its national convention in Seattle. The BSME layout was scheduled to be part of a tour of home and club layouts in the area. 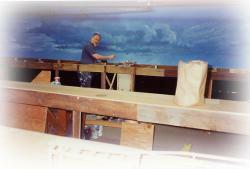 The club's goal was to have the layout completed and the majority of the scenery finished to a very high level in time for that convention. But we planned to continue working beyond that objective, refining the level of detail and adding more realism, both for our own enjoyment and that of our visitors. We had hoped to eventually acquire more of the space in the basement at 111 Grand Avenue that we might continue to fill. 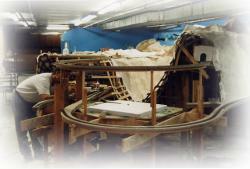 Unfortunately, the BSME lost its lease in June 2003 and had to demolish this layout. The club held its final open house at 111 Grand Avenue on Saturday, May 31 and Sunday, June 1. More than 2,000 people visited the layout during its final two days of operations. These final days were recorded in a video titled "The End of an Era." 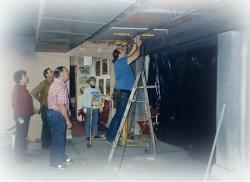 In April 2004, the BSME moved into a new home at 1469 Silver Run Lane. This new location, 10 miles south of Bellingham on the border of Whatcom and Skagit counties, while smaller than the space at 111 Grand Avenue, offers the opportunity to build two entirely new layouts, HO and N-scale, marking a beginning of a new chapter for the BSME. In the spring of 2010, members voted to change the name to the Whatcom Skagit Model Railroad Club (WSMRC), in recognition of the fact that in its new location the club attracts members and visitors from both Whatcom and Skagit counties. The name may have changed, but the mission remains the same.